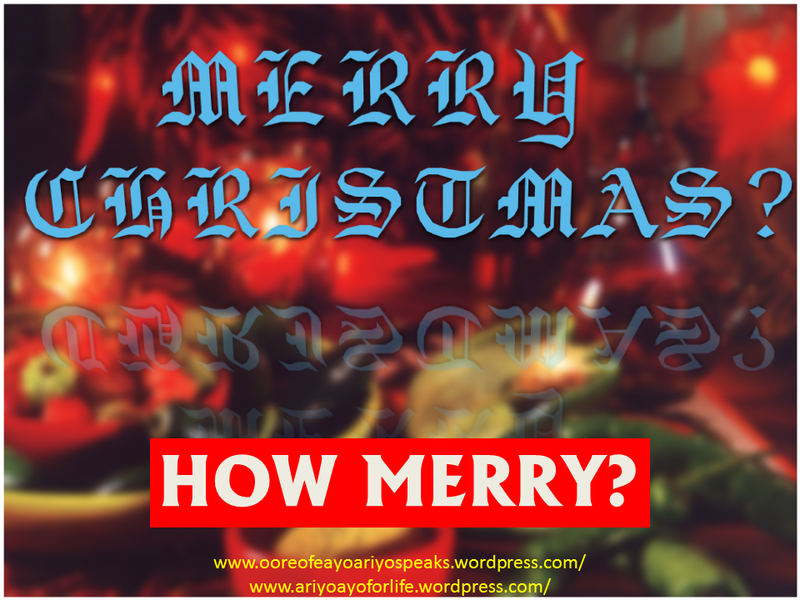 Blog | Oore-ofe A. Ariyo | The Word World…Get Inspired Here. Earn big for life! Are you ready to change your situation? This is an opportunity of a lifetime! Do you know that all the Top Ups you have made over the years should have made you a millionaire? On this platform we will share the secret with you. Do you know that the banks have been making money through us whenever we buy airtime from our bank account? The Telecoms companies pay them commissions each time you recharge from your bank account. Just imagine if you were paid 2.5% of all the airtime you purchased since you bought your sim card! That is now possible through this platform. Stop enriching the banks, and start getting paid a percentage each time you recharge your line and each time you subscribe for internet data as well as cable TV through this platform. This platform is h2i Top up and earn. I WANT TO JOIN. HOW MUCH WILL I REGISTER WITH? Membership/registration fee: N2000.00. This is a onetime payment. IF I REGISTER WITH N2000.00, HOW DO I EARN? · Referral commissions: For direct referral(1st Gen, you get N500 commission). So for example, if you referred 10 people, you get paid 10X N500=N5000. Scroll below for more details. · Top up commission: For each top up you make you get a certain % commission, and the ones your referrals make, you get a certain % commission. Scroll below to see the analysis. · Sponsors and cumulative point reward: This is analyzed below. · You can make payment with your debit/credit card. Once you register, send me your WhatsApp number so I add you to a WhatsApp group for more updates. Then send me the following details so I do the registration for you. Send the above details to this number +2348069402052 on WhatsApp after making the payment. HOW MUCH YOU WILL EARN ON EACH SUBSCRIPTION AND TOP-UP? · -You will earn 0.5% on each top-up from your direct referrals(This is your 1st generation). · -You will earn 0.3% on each top-up the direct referrals of your 1st generation(This is your 2nd Generation). · -You will earn 0.2% on each top-up from the direct referrals of you 2nd generation (This is your 3rd generation). · -You will earn N500 from all your direct referrals(This is your 1st generation). · -You will earn N300 from each direct referrals of your 1st generation(This is your 2nd generation). · -You will earn N200 from each direct referrals of your 2nd generation(This is your 3rd generation). You’ll agree with me that much of what is tagged wrongly as “love” today is none other but lust. However, that is not to deny the fact that there’s also much of genuine love existing and shown among sincere people in the world today (although you could also sincerely be lustful!). It’s always a great thing to love and be loved. In fact, the Bible commands God’s children thus: “Seeing ye have purified your souls in obeying the truth through the Spirit unto unfeigned love of the brethren, see that ye love one another with a pure heart fervently” (1Pet.1:22). The love God has for us all which was consummated at Calvary where Jesus was given for us is the most perfect form of love ever manifested—in all ramifications. What love divine! He gave His life for ours. That’s the greatest. There’s no other love as great as that and there’s no greater love than that. Jesus Christ is God’s love personified. He was made manifest in the flesh and given at Calvary after being born at Bethlehem. The government of this world will soon be at His shoulder completely—very soon. “For unto us a child is born, unto us a son is given: and the government shall be upon His shoulder: and His name shall be called Wonderful, Counsellor, The mighty God, The everlasting Father, The Prince of Peace.” (Isaiah 9:6). The angel told Joseph Mary’s husband what was to happen when Mary was pregnant of Jesus. “And she shall bring forth a son, and thou shalt call His name JESUS: for He shall save His people from their sins.” (Mat. 1:21) That was fulfilled after Jesus was born and sacrificed as the Lamb of God for us—for our total redemption from sin. There is no greater love! “For God so loved the world, that he gave his only begotten Son, that whosoever believeth in him should not perish, but have everlasting life. Greater love hath no man than this, that a man lay down his life for his friends.” (John 3:16; 15:13) The greatest love has been shown and shed abroad at Calvary for you and me. “The love of God is shed abroad in our hearts by the Holy Ghost which is given unto us. But God commendeth his love toward us, in that, while we were yet sinners, Christ died for us. And the grace of our Lord was exceeding abundant with faith and love which is in Christ Jesus.” (Romans5:5&8; 1Tim.1:14). Have you accepted it yet? How long will you spurn God’s love and go after that which does not & cannot profit. The lust of the eyes, the lust of the flesh and the pride of life will land you in destruction and perdition. Quit that line and accept God’s love today. Accept His love today so you won’t regret at that time. Be wise! Repent today (right now) and accept the true love of Jesus—the greatest love. There is just no greater love! 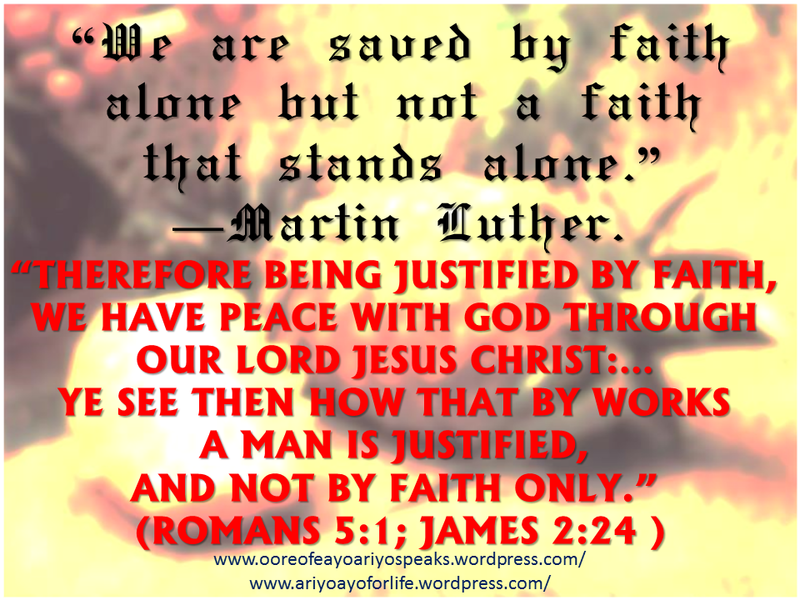 “WE ARE SAVED BY FAITH alone but not a faith that stands alone.”—Martin Luther. “Therefore being justified by faith, we have peace with God through our Lord Jesus Christ. Ye see then how that by works a man is justified, and not by faith only.” (Rom. 5:1; James 2:24). This “work” implies action—practical demonstration of faith that justifies. “Believe on the Lord Jesus Christ, and thou shalt be saved.” (Acts16:31). This believing is not empty and vague. Jesus said “The time is fulfilled, and the kingdom of God is at hand: repent ye, and believe the gospel.” (Mark1:15). Paul said “That if thou shalt confess with thy mouth the Lord Jesus, and shalt believe in thine heart that God hath raised him from the dead, thou shalt be saved. For with the heart man believeth unto righteousness; and with the mouth confession is made unto salvation.” (Rom.10:9&10). Believing is backed up by action that shows faith. “Thou believest that there is one God; thou doest well: the devils also believe, and tremble.” (James 2:19). This is why faith stands not alone. “Ye see then how that by works a man is justified, and not by faith only.” (James 2:24). Now, have you exercised this faith unto salvation? Have you repented and become free from your past sins? You can be free today and go and sin no more. Act now. “Seek ye the LORD while he may be found, call ye upon him while he is near: Let the wicked forsake his way, and the unrighteous man his thoughts: and let him return unto the LORD, and he will have mercy upon him; and to our God, for he will abundantly pardon.” (Isaiah55:6&7). Repent and be free before it is too late. I WISH YOU A HAPPY New Year! Did you make new resolutions and plans for this year? Well, that’s great if you did. However, I wish to make it known to you that mere resolutions without God’s back-up won’t do at all. Plans made without considering God will fail. If any plan will work, it must be inclusive of God in every bit. Jesus said “without me ye can do nothing” (John 15:5) and the Scripture says again that “For it is God which worketh in you both to will and to do of his good pleasure.” (Philip. 2:13). It is important to iterate here at this juncture the fact that resolutions to do right and quit/outrightly shed those wrong ways, attitudes, unprofitable paths trodden in the past or sinful habits will not work. Mere resolutions will fail except there’s grounded and empowered by Christ—through repentance. Matter-of-factly, to end sin, resolution is not the key. Confession, repentance of past sins and trusting in God’s grace through our Lord Jesus Christ is. Then, quitting sin would be beyond mere decision/resolution and there’ll be commensurate empowerment for this—which only Christ offers. So, if you’ve not yet done that, please do right now. Further delay may be eternally disastrous. Live in holiness because that is necessary to walk with God here and to be with Him up yonder. Moreover, I’d like to also emphasise that planning without regarding God the greatest and highest Master-planner could be an effort in futility ending in fruitlessness and it’s like speeding passionately towards a cul-de-sac. Foolish! Isn’t it? Consider God, regard Him, involve Him and honour Him in all your plans if you want it to be fruitful–both plan and execution. “Trust in the LORD with all thine heart; and lean not unto thine own understanding. In all thy ways acknowledge him, and he shall direct thy paths. Be not wise in thine own eyes: fear the LORD, and depart from evil.” (Prov.3:5-7). David knew this and this is why he prayed “Order my steps in thy word: and let not any iniquity have dominion over me.” (Ps.119:133). No wonder he prospered in his life’s endeavours. You too can if you totally yield to God in full surrender all through this year—one step at a time. Once again, I wish you a happy new year! “I DO NOT ADVISE that we end the year on a sombre note. The march, not the dirge, has ever been the music of Christianity. If we are good students in the school of life, there is much that the years have to teach us. But the Christian is more than a student, more than a philosopher. He is a believer, and the object of his faith makes the difference, the mighty difference. Of all persons the Christian should be best prepared for whatever the New Year brings. He has dealt with life at its source. In Christ he has disposed of a thousand enemies that other men must face alone and unprepared. He can face his tomorrow cheerful and unafraid because yesterday he turned his feet into the ways of peace and today he lives in God. The man who has made God his dwelling place will always have a safe habitation.” –A.W. Tozer. Note: this is for only the person who has made God a dwelling place. Have you? The sinner is too proud that he doesn’t. Are you? Why not repent today—now—and make a change so you’ll be best prepared for whatever the New Year brings? 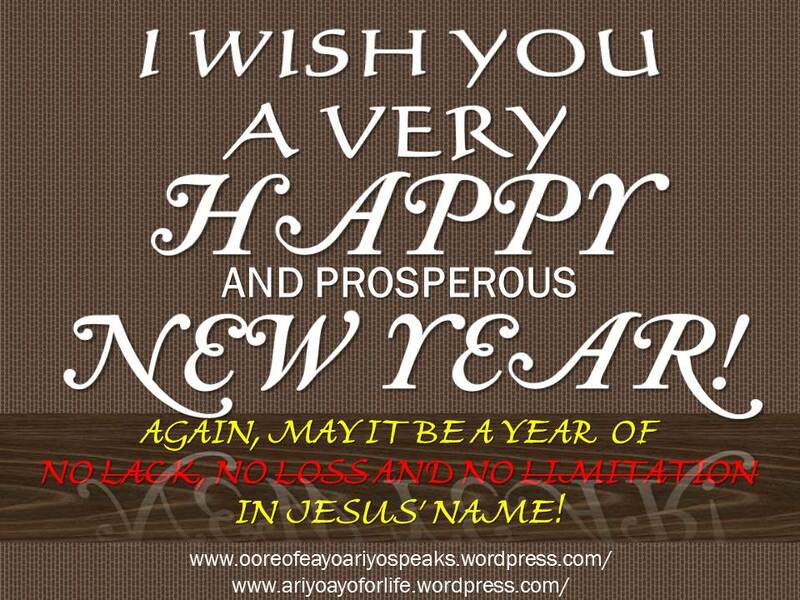 “TO EACH ONE FORTUNATE enough to live out [this year], God will have given 365 days broken into 8,760 hours. Of these hours, 2,920 will have been spent in sleep, and about the same umber at work. An equal number has been given us to spend in reverent preparation for the moment when days and years shall cease and time shall be no more. 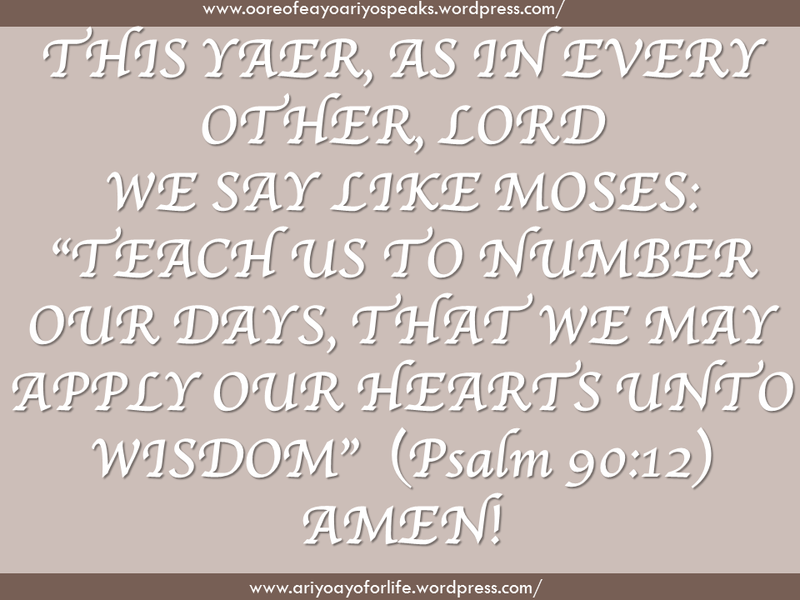 What prayer could be more spiritually appropriate than that of Moses, the man of God: ‘Teach us to number our days, that we may apply our hearts unto wisdom’ (Psalm 90:12)?” –A.W. Tozer. So, as the year ends, think about how you’ve spent it, what you achieved and what you failed to achieve. Use that to gather purposeful momentum towards achieving greater things and attaining greater heights in the coming year. Don’t forget to count your blessings too. Name them one by one. As you realise and praise God for all He has done, let your faith in Him rise and trust Him for better things and better days ahead. QUITE A LOT OF FOLKS of various religions—Christianity inclusive and in particular—merely take pleasure in wishing others a “merry Christmas” while living without Christ whom they claim Christmas is all about. How awkward! Merriment without Christ? No, that’s not real! Do not be deceived, there is really nothing to be merry about without Christ. Life without Christ is a miserable one which will lead to a more miserable eternity without Christ. “And he said, This will I do: I will pull down my barns, and build greater; and there will I bestow all my fruits and my goods. And I will say to my soul, Soul, thou hast much goods laid up for many years; take thine ease, eat, drink, and be merry. But God said unto him, Thou fool, this night thy soul shall be required of thee: then whose shall those things be, which thou hast provided?” (Luke 12:18-20). Sin messes you up, makes you miserable and leads to eternal perdition in hell. And I tell you, as the Bible reveals, there is nothing to be merry about in hell. Absolutely! “And the devil that deceived them was cast into the lake of fire and brimstone, where the beast and the false prophet are, and shall be tormented day and night for ever and ever. And whosoever was not found written in the book of life was cast into the lake of fire.” (Rev.20:10 & 15). Hey! Take note of this please: it is not wishing others a merry Christmas or even supposedly celebrating it that endears anyone to God or that guarantees eternal merriment for any either. Nay rather, it is receiving Christ and staying with Him that does. A sinful life really knows no true merriment but real misery (though a sinner may pretend to be merry). It’s deep down within—the guilt, shame, unuttered pain and misery. On the other hand, heaven is merry when a sinner comes out of the misery of sin into the true life of merriment (peace and joy within the heart and soul) which only Christ offers. “I say unto you, that likewise joy shall be in heaven over one sinner that repenteth, more than over ninety and nine just persons, which need no repentance.” (Luke15:7). This is why you need to respond to the Saviour’s call: “Come unto me, all ye that labour and are heavy laden, and I will give you rest. Take my yoke upon you, and learn of me; for I am meek and lowly in heart: and ye shall find rest unto your souls. For my yoke is easy, and my burden is light.” (Mat. 11:28-30) Have you? Moreover, the Kingdom of God is not all about physical merriment in wantonness, drunkenness, outrageous/flamboyant partying and wasteful spending in the name of celebration which is what we see characterizing most of the so-called Christmas celebrations today. “For the kingdom of God is not meat and drink; but righteousness, and peace, and joy in the Holy Ghost.”(Rom.14:17). “And take heed to yourselves, lest at any time your hearts be overcharged with surfeiting, and drunkenness, and cares of this life, and so that day come upon you unawares. For as a snare shall it come on all them that dwell on the face of the whole earth. Watch ye therefore, and pray always, that ye may be accounted worthy to escape all these things that shall come to pass, and to stand before the Son of man.”(Luke 21:34). Let’s take a cue from Jesus Himself. We find no record of where He celebrated even His own birthday. He was so consumed with His Father’s business. He was overwhelmed with the compassion for the people who were spiritually poor, needy, hopeless and straying like sheep without shepherd. He spent His dawns communing with the Father; His days finding the lost to save, heal, help and provide for their needs (including feeding them physically and miraculously when necessary); and His nights He spent in ceaseless prayers to the Father. Any other thing outside this was regarded as a waste of time. Now, how do we say we are Christians—“Christ-like”, “Christ’s followers”, “Christ’s disciples” or “little Christs”—and yet do otherwise? Any “celebration” in the name of Christ should be done as Christ would have done it—with reference, awe, worship, prayer, seeking the lost, seeking God’s glory and power to be manifested, seeking His will to be done and seeking His Kingdom to come and be established on earth. Only the wise will heed the words of wisdom.